Updated: January 2017 – All information has been updated for 2017. Let us know if you have any comments on the reviews below. Like nearly all of Sonos products, the Sonos Playbar TV Soundbar and Wireless Speaker offers a sweet alternative to the competition in the audio world. Its advanced wireless technology provides the ability for the user to stream music to the device from nearly any source including local storage or the cloud. As one of the fancier units in the home theater market, the Sonos Playbar is as rugged as it is handsome. At just over 3 inches deep, and 5 inches tall, this nearly 36 inch long unit fits ideally underneath most flat screen televisions. It is perfectly suited for 42 inch TV sets and bigger. With quick access to the mute button, volume toggle, and LED power light, all located on the right side of the unit, it is easy to function even without the remote. Like all of the Sonos products, its quality construction is excellent. It is extremely simple to install. Paired with a high quality sub, it provides a rich and rewarding home theater audio experience. As one of the more excellent-sounding sound bars available, the Sonos Playbar sound quality does not disappoint. The Playbar itself consists of nine amplified speakers which provide a rich audio experience. It is expandable to 3.1 system with the addition of SUB and Boost or 5.1 surround sound system by adding two PLAY:1 wireless speakers. The best part is the included Sonos app accessible using your smartphone, tablet or computer; it allows you to ultimate control of your sound system for a truly wireless setup. If you’re wondering how good the Playbar is by itself, the audio quality is good enough if you have a small room or apartment. It sounds great even without the subwoofer, especially if you use it mainly for streaming music. However, it’s even better if you pair it with the SUB as there’s a HUGE difference in sound quality, which you can tell when you watch movies. The downside is that having this setup will set you back at $1400 which is quite pricey. If your budget is limited, there are other options and we’ll get into that later in this article. We’ll also discuss how the Sonos fares compared to other brands. A true leader in audio technology, Bose produces high quality speakers and sound systems. The Bose Cinemate Home Theater System provides you with 3 different options to choose from: 120 Series, 130 Series and 520 Series. Both the Cinemate 120 and 130 Series include the control console, Acoustimass (bass) module, remote control, and soundbar. Whereas the 120 and 130 models have a soundbar speaker, the 520 series consists of 5 separate compact speakers. 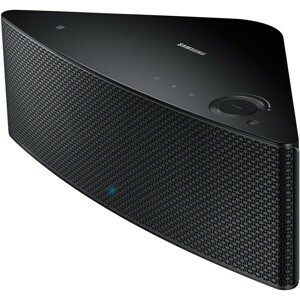 At the heart of the setup is the 17-inch soundbar ( for the 120 series) which is quite compact compared to other brands. 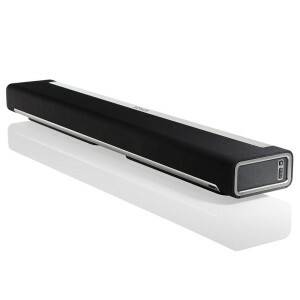 The soundbar consists of five speakers inside which delivers a powerful audio experience. If you want a bigger soundbar, get the 130 series as it’s soundbar speaker is 36.8 inches wide. 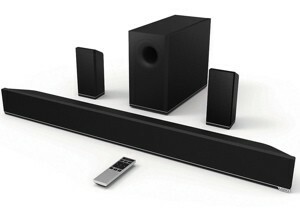 In addition, the Cinemate 130 soundbar can be laid flat or mounted on the wall. There’s a wireless bass module, which can be tucked out of the way with a signal range of 30 ft. The control console consists of 4 HDMI inputs so you can attach not just one device to it. The universal remote is easy to use. An optional SoundTouch adapter allows you to stream music over your Wifi network so you can listen to internet radio and other music streaming sites. Please note that you’ll need to buy this adapter separately and would cost you nearly a hundred bucks. Bose Cinemate includes a proprietary audio calibration system called ADAPTiQ which will optimize your audio to the size of your room, the furniture you have and the kind of floors you got. Sounds pretty cool, doesn’t it? The Bose Cinemate 520 Series Home Theater System claims to offer “true” 5.1 surround sound with its five slim-designed reflecting speakers, engineered by Bose to provide wide panoramic sound effects. It’s important to note that both 130 and 520 costs the same so it’ll come down to your preference. Both delivers exquisite audio performance. The only difference is that with the 130 system, you get one wide soundbar speaker whereas with the 520 model, you get 5 separate speakers. If you have a large room and won’t mind the extra setup, get the Cinemate 520. If you have a small to medium-sized room or want to have less wires to deal with, you’d be better off with the 130 series. You’ll see in the video below how easy it is to setup. In terms of cost and overall value, you’ll probably save money and still get a quality home theater setup with the Bose Cinemate. Getting both the SONOS PlayBar and the SUB would cost you more than the Cinemate 520 system, and that’s even without the PLAY:1 or PLAY:3 speakers. Indeed, the Sonos setup is more expensive but it is truly wireless, and by that I mean everything is wireless including the speakers. 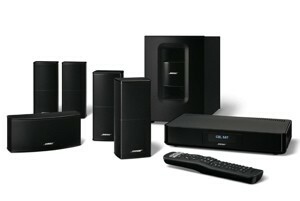 In contrast, other 5.1 systems including the Bose Cinemate would require the rear speakers to be wired to the system. Only the bass / subwoofer unit of the Cinemate is wireless. If you’re after a rich cinematic movie experience at home without spending $1,500 or more, then the Cinemate system is the right fit for you. However, if you’re looking for a multi-room audio setup, then the SONOS would be a great choice. If you want a surround sound home cinema experience but have a limited budget, the Vizio 5.1 system would be a perfect fit for you. The Vizio setup consists of a soundbar (you have 2 options: 38-inch and 54-inch), subwoofer, 2 rear speakers and a remote control. An inexpensive surround sound system, the 38-inch soundbar setup costs less than $250 while the 54-inch soundbar would cost you just under $500. The subwoofer is wireless, however the two rear speakers are not. They are attached to and powered by the wireless subwoofer through 15-ft. wires, which is generous enough to go through the length of a standard sized living room. Just because it’s cheap doesn’t mean it’s not good. Featuring Dolby Surround Sound and Bluetooth connectivity, you can seamlessly stream music from your smartphone, tablet or PC without much fuss. With all the basics covered, it’s safe to say to say that this is the best surround sound system under 500 dollars. Take note, though, that this system works best when paired with a Vizio TV. One customer pointed out a delay between the audio and video when he used it on a Sony Bravia TV. Customer feedback on it’s setup is varied; some say it’s a breeze, others complain it’s a hassle to set it up. I guess it would depend on your existing TV and home entertainment setup. Comparing the Sonos PLAYBAR with the Vizio Soundbar is like comparing apples to oranges – they’re totally different except for the fact that they’re both soundbars. With the Sonos setup, the Playbar alone costs more than the whole Vizio system. The Sonos is a premium product with a high price tag whereas the Vizio system is a low cost entry level home theater setup. The Sonos is fully wireless while the Vizio has wired speakers attached to the wireless subwoofer. Setup is like plug ’n play with the Sonos whereas Vizio requires an initial time-consuming process. Sound quality? The Playbar itself trumps the entire Vizio surround sound system, but that’s expected considering the Playbar costs more and is on par with Bose audio. Although Samsung has many soundbar models on the market, a more notable surround sound setup is the Samsung HW H750 with an 8.1 channel for a truly surround sound experience. Perfect for TV sets at least 55-inch and larger, this surround sound system comes with a 48-inch wall mountable soundbar and a wireless subwoofer. One satisfied owner of this unit remarked how great the sound is, and even compared it to a Sony 7.1 Home Theater System. Customers raved about how movies sound just like you’re inside the theater. It’s easy to setup and install, especially if you pair it with a Samsung TV. It connects wirelessly to the TV via Bluetooth which is pretty much a no-brainer if you have a Samsung TV, but if you don’t, there’s a nifty app for that purpose. Please note that you can’t use your Samsung Smart TV remote to control the soundbar’s power so you need to use it’s own remote control. Another thing worth mentioning is that this unit does not come with HDMI cables or fiber optic audio cables; you need to get it separately if you don’t already have them. 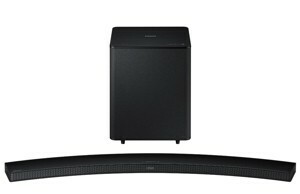 At under $700, the Samsung H750 is on the high end of soundbar and wireless subwoofer systems. However, for this price, you get not only the soundbar but the wireless sub as well. If you use the Sonos set-up, it’ll cost you twice as much. The HW-H750 and H7501 is Samsung’s answer to the Sonos Playbar. In fact, The Verge thinks that “Samsung did in a single quarter what took Sonos years to deliver”, referring to the array of Samsung’s product line that rivals Sonos. The Samsung HW-H750 soundbar with wireless hub can be setup to include a multi-room audio system with the M5 and M7 Shape speakers. So which one should you choose? That depends on your budget, your needs and your existing TV and home entertainment setup. If you already have a Samsung TV or plan on getting one, then it’s best to just get the Samsung soundbar. Even its multiroom wireless setup won’t cost an arm and leg like the Sonos does. Video game enthusiasts, music aficionados, and movie fanciers usually cannot get enough of the realistic live experience of audio sound produced by a high quality home surround sound system. Without the need to run complicated and messy speaker wires, the experience avoids the tripping hazards and eyesores when needing to run wires beneath the carpet or flooring. The latest generation of the best wireless surround sound system gets the user into the middle of the action without all of the wires and fuss. I’ve auditioned all of these wireless systems before and the problem they all share is a delay in the source signal reaching them, which causes an unwanted echo-like effect.